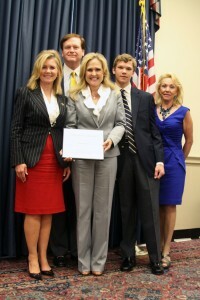 HopeHouse International Founder Recognized at National Event in Washington, D.C.
FRANKLIN, TN – Sept. 28, 2012 – Franklin-based HopeHouse International was recognized by Rep. Marsha Blackburn (TN-7) as a 2012 Angels in Adoption™ recipient for its outstanding advocacy of adoption. The Congressional Coalition on Adoption Institute (CCAI) honored Deneen Turner, Co-founder and President of HopeHouse International, during an awards ceremony and gala event September 11-12 in Washington, D.C. 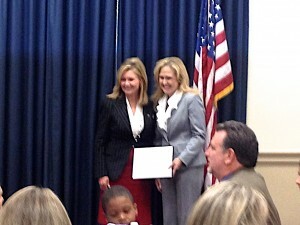 Congressman Marsha Blackburn presenting Deneen Turner and HopeHouse International with the Congressional Coalition’s “Angel in Adoption” award. Turner was honored for leading HopeHouse International, a 13-year old non-profit organization based in Franklin. The organization assists Christian-based Ukrainian couples with adopting Ukrainian orphans. Adequate housing is a barrier for most Ukrainian citizens, and it is a government prerequisite for adoption, therefore, HopeHouse International enables adoptions by providing adequate housing for families, resulting in their ability to adopt three or more orphaned children. To date, HopeHouse International has ERADICATED the equivalency of five orphanages, closing their doors in the Ukraine and breaking the cycle of homelessness, suicide, imprisonment, and trafficking for those orphans who have been adopted into a loving family. The Angels in Adoption™ program is CCAI’s signature public awareness campaign and provides an opportunity for all members of the U.S. Congress to honor the good work of their constituents who have enriched the lives of foster children and orphans in the United States and abroad. In addition to the more than 140 Angels from around the country, several “National Angels” were recognized at the ceremony and gala for their dedication and commitment nationally and internationally to child welfare on a grand scale. This year’s National Angels in Adoption™ were actress Katherine Heigl, singer/songwriter Josh Kelley and PEOPLE Magazine. Former National Angels include First Lady Laura Bush, Patti LaBelle, Jane Seymour, Muhammad Ali, the late Dave Thomas, Steven Curtis Chapman, Bruce Willis, Alonzo Mourning, Rhea Perlman and Kristin Chenoweth. CCAI was created in 2001 by the active co-chairs of the bicameral, bipartisan Congressional Coalition on Adoption (CCA) to more effectively raise Congressional and public awareness about the issue of adoption. The Angels in Adoption™ program was established in 1999 as a Congressional press conference to honor outstanding individuals. Since then, the program has developed into a yearlong public awareness campaign culminating in an extraordinary awards Gala and celebration inWashington, D.C.
CCAI does not receive any government funding and they rely on the generous support of foundations, corporations, and individuals to accomplish their mission. For more information visit www.ccainstitute.org and www.angelsinadoption.org.